By joining your local council does not mean that you need to sacrifice quality time with your family. By volunteering an hour here or an hour there – with your family – can make an enormous difference in your life and in the lives of others. Widow Benefits – a) continues to be covered under the Member/Spouse Fraternal Benefit; b) may purchase life insurance, long-term care insurance or annuities up to one year after insured member’s death; c) receives a free lifetime subscription to Columbia; d) eligible with her children for scholarships, student loans, etc. Leadership Development – Opportunity to build personal leadership skills, public speaking ability, organizational skills, etc. If you are a practical Catholic man, age 18 or older, we welcome you to join the leading organization of Catholic laymen. Being a Knight is more than camaraderie; it is being involved with your community; it is supporting your local Catholic Church, while enhancing your own faith; it is about protecting and enhancing your family life. 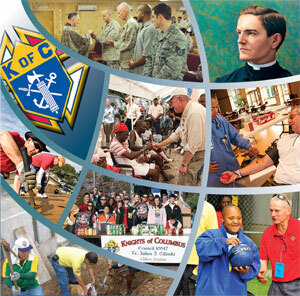 If you are interested in joining the Knights of Columbus, please complete our online form by clicking the link below. Email Us @ kofc4847@gmail.com for information on how to join and to meet with a member of our Admission Committee.